Christmas tree trends reach far and wide for 2018, from sedate pastel themes to wild neon needles. No matter how you decorate your tree — ombre, sports-themed, or simple white lights — we can all agree that sometimes the hardest decisions to make are about exactly where the tree should sparkle. You may know which room will best show off your tree because of the broad bay window, cozy corner next to the fireplace, or in the middle of the family room with space for the kids to run around it and decorate. 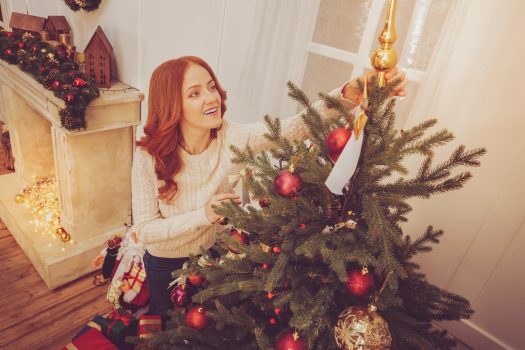 But if your spaces are limited or so varied they’re hard to choose from, make the following tips into tie-breakers or helpful hints for placing that gorgeous tree. You will need a pencil, a notepad, a small ladder, and tape measure to plan the perfect placement. Start by making a floorplan of the room’s furniture and features, like windows, doors, sofas, tables, and shelves. Leave 36 inches for at least two guests to pass one another without knocking into the decor. Consider moving smaller, less necessary furniture — unless you plan to stand a mini tree on a side table — out to use in other rooms and do a little math on the space you plan to use. Measure floor to ceiling and subtract a foot. Your tree-topper should have at least 5 inches of clearance from the ceiling, so a typical 8-foot ceiling can accommodate a 7-foot tree. Also, remember to account for the height of your tree stand, if you’re using one. Look around for electrical outlets to light the tree and measure their distance. Measure the width and depth of the space. Both dimensions should be a foot bigger than the tree’s. You’ll want plenty of space to water and care for a natural tree, plus a place to sweep away needles and clean up any spills. You’ll also want that extra space to get around the back of the tree to hang decorations. Remember to buffer sharp tree stand feet from delicate flooring. Also, if your tree is natural, you’ll want to keep it at least 8 feet from a fireplace for the tree’s health and for your safety. In terms of tree shape, tall, slender trees work well in smaller spaces with sharp corners in which to nestle. And if you’re looking for the illusion of a larger, fuller tree without the space one take up, consider an artificial half-tree that leans flush against a wall but swings out in front to give the idea of grander scale. Whether your tree is petite and personalized or tall and dreamy, make it the memorable focal point of your festivities! If you’re looking for home upgrades to complement your holiday decor, come to Meyers for new flooring and furniture before the guests arrive.